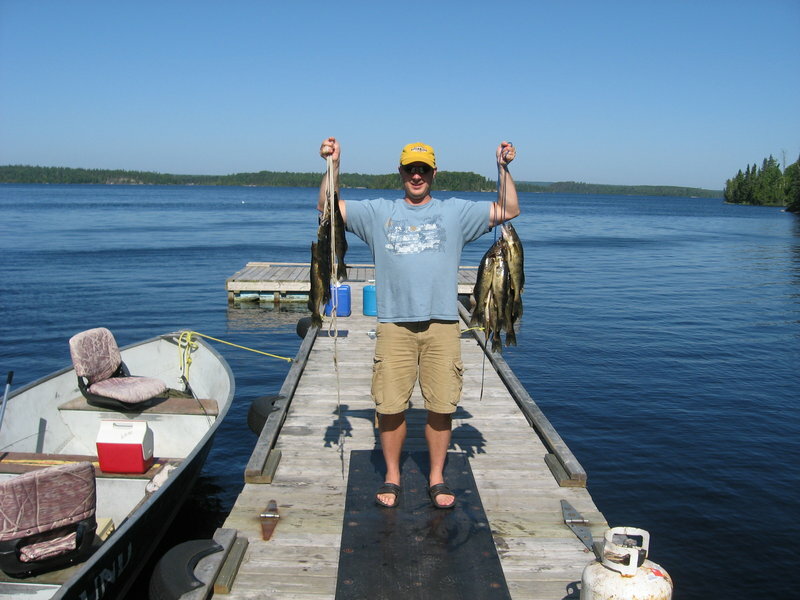 Wapesi, a favorite lake for many people for many years, continues to boast some of the best walleye and northern pike fishing in Canada. 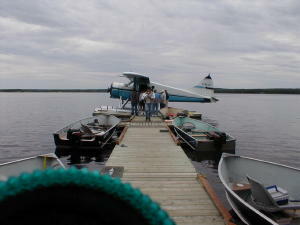 Wapesi Lake, a 30 minute flight from Sioux Lookout, is 12 miles long and ideal for larger fishing parties. 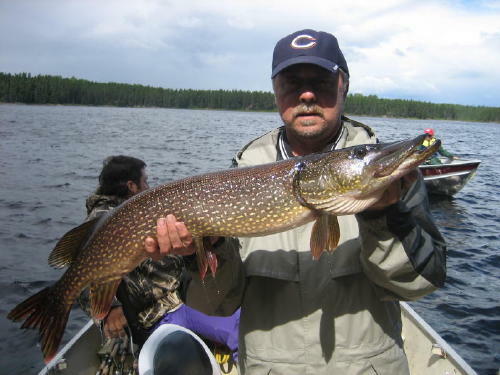 Trophy northern pike and walleye are commonly caught in these very dark waters but the lake is known mainly for the abundance of fish. 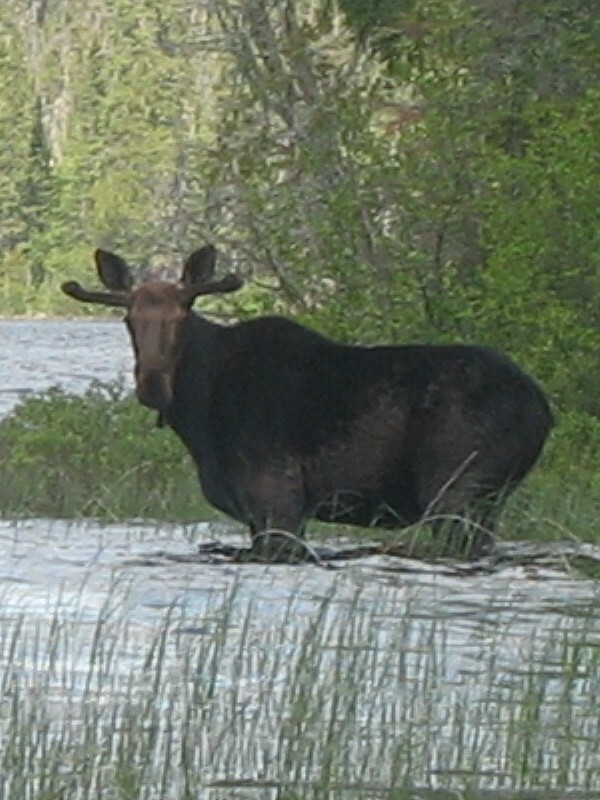 The area is home to many moose, eagles, beaver, otter and mink that guests frequently "shoot" to accompany the fishing highlights, northern lights, and breathtaking sunrises and sunsets in a prize photo collection. Wapesi Lake is ideal for fishing parties from 4 to 16 . TWO BEAUTIFUL LOG AND PINE CABINS are equipped with all cooking utensils, propane fridge, stove, lights, barbeque and fish fryer. Each cabin has indoor washrooms with shower. Your group with a minimum of 8 people, have the whole camp to yourselves. Our lake manager is on the lake to make sure that all boats, motors, fridges, freezers, etc. are in top working order. Our 14ft. Lund boats all have new cushioned swivel boat seats for your fishing comfort. A full-sized freezer run by a generator has plenty of complimentary ice for our outposts on the lake as well as room to freeze your fish. Our lake manager has a phone to communicate with us daily at the main office so we can keep on top of everything and you can spend your time enjoying your private vacation. 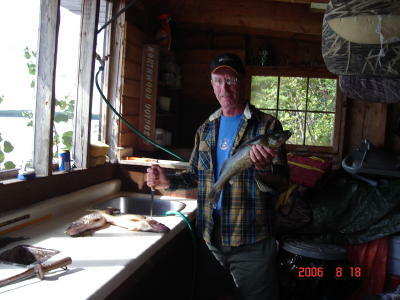 This camp, at the south end of Wapesi Lake, has propane fridge, stove, lights, hot water tank, barbeque, fish fryer, and indoor washroom with shower. Boats with new swivel seats, motors and gas are waiting for long restful fishing days. 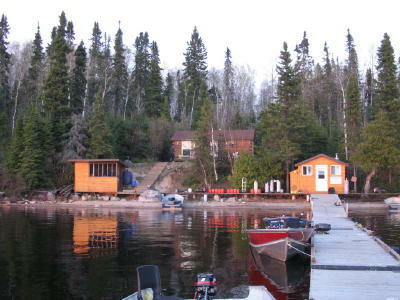 This cabin is located on a narrow strip of land at the south end of the lake. It is a favorite for many because, if it is windy, you can always sneak around to the back and fish the river and bays in shelter. At all our outposts on Wapesi Lake, our lake manager meets your plane, brings you complimentary ice, and generally makes sure that everything is in top working order so that your vacation is an enjoyable success.